Wow, it's been 8 months since I posted anything to my blog. 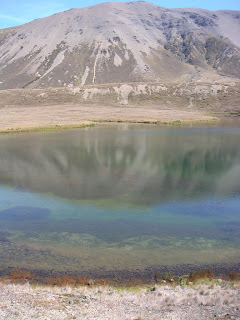 Proof that life in New Zealand is wonderful! It's been a great summer here, much better than last summer. At New Year's we went camping 50km north (on a gravel road) of Hanmer Springs and had a lake all to ourselves for 3 days. 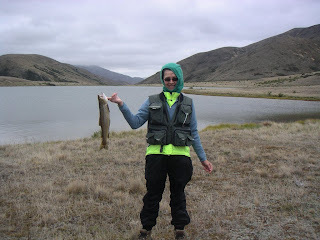 I finally caught my first trout while we were there. One morning we awoke to find ourselves completely fogged in. 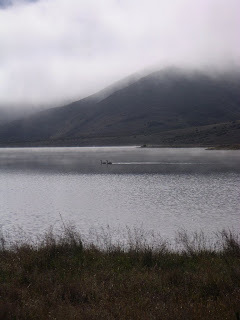 Then the fog gradually disappeared (can you see the 2 black swans in the photo below?) and it turned into a beautiful clear day without a breath of wind. The other thing I have been doing this summer is playing tennis. I have played an occasional game over the years but never really focused on it. It is loads of fun. And I'm actually improving. Ross doesn't have to let me win an occasional game now to cheer me up! I've also been learning to play golf and, maybe because I never did it in the past, it has not been as successful - alas. And it is way more frustrating than tennis. As a matter of fact, I bought my second hand clubs from a woman who got so frustrated she decided never to play again. Hopefully the clubs aren't jinxed in that direction! We usually play at a par 3 course and my best score so far is 80 for 18 holes (Ross' best is 59!!). So I decided to be brave and go to a 'real' golf course. I didn't even make the 18-hole par in 9 holes! Well at least there is lots of room for improvement! The other exciting thing in my life is that Ross and I have bought a house together. 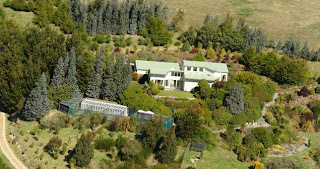 It's a 12 year old house up at 400m elevation in the Port Hills and it's on nearly 120 acres! 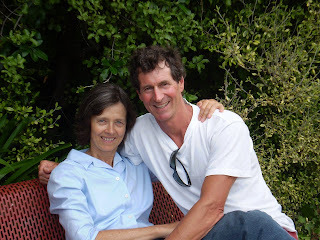 It has beautiful gardens, lots of trees for shelter (Christchurch is famous for wind), a 'chook house' (the current owners used to sell free range organic eggs), a glass house (green house) with a shadecloth area for plant propagation and views to die for. 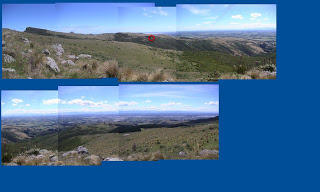 It's adjacent to a reserve called Kennedy's Bush so we went for a hike there and I took a bunch of photos and put them together into a panoramic view. The red circle is our house. It has 3 bedrooms plus 'in-law' quarters at the back of the garage. So we'll be all set for visitors. Well I guess that's all for now. Hopefully I won't wait 8 more months till my next posting. And hopefully my next posting will work - our new place is too far up the hill for DSL so I am going to sign up for satellite internet! Was 'bout to email you & see how things were going when this popped up in my reader! 120 acres!? Is it a house, a farm or a scenic reserve?